Square-Enix’s Bravely Default originally started development as a sequel to Final Fantasy spinoff The 4 Heroes of Light, although it ultimately became a Divorced Installment, one that received positive reception in and out of Japan. 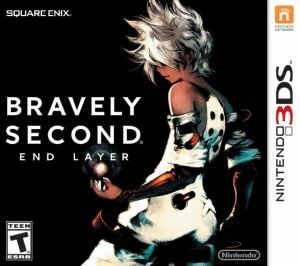 Naturally, developer Silicon Studio produced a sequel like its predecessor on the Nintendo 3DS entitled Bravely Second: End Layer, which for the most part rectifies the issues of its precursor, and while some new problems abound, the second entry in some respects shows that Square-Enix somewhat listened to the positive and negative points of its prequel’s reception. The four playable characters, two new and two returning, begin as Freelancers, although players eventually gain access to a variety of different classes, such as a great many magical types specializing in specific kinds of magic (with new spells of these sundry varieties buyable from shops), and jobs centered around melee abilities. Bravely Second for the most part follows the same gameplay rules as its predecessors, with each character able to Default (or defend) to build up Brave Points to expend to perform up to four consecutive commands during their turn, with negative Brave Points necessitating said ally wait a certain number of rounds until their Brave Points break even at zero. A new mechanics is that if a player wins a battle in one round (except in battles where enemies gain a preemptive strike), they can continue to a consecutive battle where, if they win, experience and job points multiply, repeatable until encountering a fight that takes more than one round, which can be handy in leveling (and the game is nice enough to indicate recommended level ranges within each dungeon). As with before, the encounter rate is adjustable (albeit fixed in some instances like early in the game and in one dungeon), and selectable difficulty accommodates players of different skills. Overall, the gameplay tends to work well, with only minor issues involving the tedium of adjusting auto-battle commands. In regards to control, things are for the most part superficially good, with things such as automaps for dungeons, an item allowing the player to return to the entrance of a dungeon and leave prematurely, easy shopping, seeing how equipment increases and decreases stats before buying it, and so on. However, while the game does a nice job for the most part telling players where to go next to advance the storyline, there is one point that leaves players completely in the dark about how to do so, with the solution not really obvious and driving this reviewer to use a guide, something no one should ever have to do when playing a game. In the end, interaction somewhat stumbles. The narrative, however, stumbles even more, since, alongside the aforementioned poor direction, it doesn’t really break new ground in the RPG genre, and some people might find themselves lost if they haven’t played the first game or waited a long time before picking up its sequel. The translation is mostly good, although it somewhat goes overboard with pun-filled names, odd since the story itself doesn’t really have much humor, and there are some occasional oddities such as “coup de gravy,” Edea’s horribly-unnatural grumbling “mrgrgr” (“mur-gur-gur”), lots of untranslated French phrases, and the like. Ultimately, the plot is largely a deterrent. Like its predecessor, however, Bravely Second has a solid soundtrack with many superb tunes like the first town theme, and players have a choice between Japanese and English voices, a boon since the latter leaves plenty to desire, with many annoying characters and incongruities such as newcomer Magnolia’s peppering her speech with French phrases despite not having a normal Francophone accent. There are also some silent parts such as towns at night, although the sound is generally great. The visuals are largely the same as they were in the first game, not a bad thing since they generally look nice, with good use of 3-D and towns having prerendered styles that occasionally move around as the player navigates them, although, as with many other aspects, there exist some oddities, such as characters, during cutscenes, constantly flapping their lips even during dialogue pauses, and eating with no utensils or food in sight, not to mention city scenery appearing pixilated when the camera zooms in to the models. Finally, the sequel is about a one-to-two-day game, with plenty sidequests and a New Game+ mode to prolong playtime. In the end, Bravely Second is a solid sequel that mostly hits the right nodes regarding its gameplay that effectively builds upon its predecessor’s mechanisms, significantly-lightened repetition, solid soundtrack, pretty visuals, and plentiful lasting appeal. However, it still has issues such as one significant area of cluelessness regarding how to advance, the dry narrative, some issues with the localization, the weak English voicework, and some occasional graphical anomalies. Regardless, those that enjoyed the first game will most likely enjoy its sequel, and hopefully its developer will learn more from the game and produce an even-more-refined third entry. +Combat very well builds on that from first game. +Eases up on first game’s repetition. -Graphics more or less the same.